Fuimaono Karl Pulotu-Endemann (centre) is one of New Zealand's best-known and most honoured fa'afafine (Samoan males who behave in a variety of female ways). 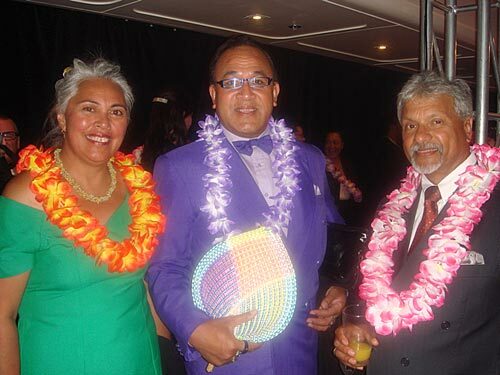 He is seen here with fellow Samoan leaders Luamanuvao Winnie Laban and Anae Arthur Anae. Pulotu-Endemann came to live in New Zealand as a small boy and trained as a psychiatric nurse. He later became an independent consultant on Pacific health issues and developed the Fonofale model of Pacific mental health, accepted by the Mental Health Commission of New Zealand as the standard for treating Pacific mental health. Pulotu-Endemann holds the title Fuimaono, given to an ali'i or high chief of Western Samoa.